Home » Articles » 164. Crossing Your Arms: What Does It Mean? ← 163. The Best Thing You Can Do When Ill! 164. Crossing Your Arms: What Does It Mean? “You’re ‘closed off’ if you sit with your arms crossed over each other.” “You’re not ‘open’ to others.” “You’re resisting others.” “You don’t cooperate and therefore don’t really want to grow.” Those are some of the labels you’ll hear. During a conversation. During a training session. During a meeting. The other person finds it difficult and interprets your body language, drawing incorrect conclusions! They see how they can “open” you up, baiting you, pulling and pushing you, maybe even forcibly. As if you were an oyster that needs to be opened. But what if crossing your arms has another meaning? What if it is a form of protection? Not because you don’t want to grow, but to protect yourself from the other person. Maybe that person is not safe to you, or the setting in which you find yourself is not safe. You could hear bad news any moment, be judged. Or your words could be used against you. It’s anything but safe and “being open” is the last thing you want. In the MIR-Method we find step 8: Optimize chakras. When you say this step, you work on optimizing your chakras and aura. That can mean all kinds of things. Your sub-conscious knows what is needed. I’m only taking a look at the chakras now because they are involved in crossing your arms. Optimizing has various effects. You chakras might be too open, for example, and should close somewhat. It’s possible that they don’t function well because of old pain or traumas from your past. And it’s possible that they are too closed, holding back a part of your strength. Each chakra is different and will be optimized in a different way. One will become more open; the other more closed and from every chakra old pain will disappear, such as from traumas. At the level of your stomach is chakra 3, also called “Manipura”, or “lustrous gem”. This is a very important part of your body, for your identity (who am I really? ), for your sense of determination and also for your happiness and anger. If you cross your arms, it’s possible that you are protecting yourself. From someone else’s energy. From someone’s manipulations. From someone trying to change you. And… it’s even possible that you are protecting the other person from you! That you are preventing yourself from bursting out in anger. From giving way to your power so as not to worsen a situation. You may be holding your real power inside! If you do the MIR-Method, your chakra 3 becomes stronger. You feel more strongly who you are; that you have a right to exist. That you may take up your own space. It becomes more difficult to hold yourself in and to let people walk over you. That is very exciting, because what will happen if you open your mouth? Still, at some point, you can no longer hold yourself in and feel your own strength. With words, but also with your body, your energy and your sense of determination. Doors will open more easily for you; suddenly other people will listen to you and take you into account! With no effort at all! Do you recognize this as well? That you regularly sit with your arms crossed? Do you notice that people are taking you into account more? That people are listening to you more? That you’re being taken more seriously? Please write about it below. Thank you! My wish for you is that you can live increasingly in your great strength! 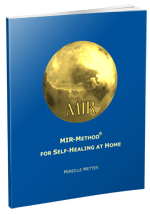 How wonderful that you embraced the MIR-Method! And yes, I love to unfold why we do things as humans. It makes our lives so much more pleasant! Keep on protecting yourself! I get so many emails & yours is one of the few I actually read & I read it first. It never disappoints. Thank you with all my heart! Gratitude & hugs to you Mireille!!! That is an awesome compliment, thank you! I try to keep the information as real as possible, coming from my own observations in every day life. Will keep on going!